I don't know exactly what to say when I see Unity up in arms over Betty DeVos. They have a point about how bad she is, but I'm not sure they're the ideal people to deliver this message. Of course there are some pretty strong arguments against her. I mean sure she's a billionaire. Sure she's never attended a public school, and sure she hasn't sent her kids to any either. Sure she's married into the Amway family, and sure her brother runs Blackwater. In fact, she's never even held a job before. Is this a good place to start out? President-elect Donald Trump says she's good enough for him. That doesn't sound very good at all. But I know the guy who wrote the blog they feature, and he does indeed oppose "school choice." He's not an apologist for charters, and he was pretty disappointed that Hillary (who told the AFT convention that we could "learn from public charter schools") was. I guess UFT Unity didn't read his withering commentary on Hillary Clinton. He didn't vote for her. In fact, I offered to swap my NY Hillary Clinton vote for his PA Jill Stein vote, but it was a no go. On the other hand, how can we effectively deplore half truths, ad hominem and sexist statements when we freely indulge in them ourselves? 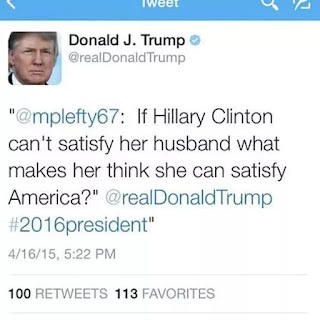 Of course, UFT Unity isn't alone in tweeting sexism. Now I'm used to their superficial and juvenile approach to argument. My friends and I have been on the receiving end of it since 2005, when we shocked them by objecting to the contract that brought us the Absent Teacher Reserve, among other things. Since I've been chapter leader, several Unity Caucus UFT employees have seen fit to instruct me what to believe. They're shocked when I tell them I'll do as I like, and argue right up to the point when I ask, "What are you gonna do, expel me from Unity?" They're accustomed to absolute fealty from loyalty oath signers, and they're unaccustomed to hearing about when their patronage employees behave in counter-productive and idiotic fashion. Remarkably, though, that's not their worst offense here. What they fail to notice is that we ourselves have enabled a whole lot of this "school choice" nonsense. In fact, Betsy DeVos herself has supported vouchers for years. When she was unable to get voters to approve, she turned her attention to charters. That's pretty much par for the reformy course. And we, the AFT, NYSUT, and the UFT jumped right on board the charter bandwagon. In fact, UFT not only opened and colocated our own charters, but also brought the execrable Green Dot and its founder Steve Barr to New York. We are not nearly as credible as we should be when we speak against school choice. Vouchers are simply the next step. We think if we give the reformies Czechoslavakia they won't turn around and invade Poland. But of course we are blind to the lessons of history. We are intent on learning nothing and keeping up the status quo no matter what. We need a "seat at the table" so you can have the ATR. We give up the right to grieve letters to file. We give up on seniority placement. OK you can rate and fire us based on test scores. We'll defend Common Core even if it means punching our own members' faces out. And oh, sure, we support mayoral control and charter schools. Even when we select a presidential candidate we don't want to be too demanding. Let's not go for that old guy who wants healthcare and college education for all. Who needs a living wage? Let's get behind good old reliable More of the Same. How can we go wrong? In fact our path of appeasement has gone spectacularly wrong, and we have crocodiles in our living room. Should we just pretend they aren't there and hope they don't make their way up to the 14th floor? Can crocodiles learn to use elevators? After all these years, we're still asking the wrong questions altogether.